and earn the badge of honor (a free magnet)! SWIMMING: The river is great for swimming, and though it is not a “beachy” river, there are several access points available to all. The water is slow moving, not too deep and once you step away from the muddy banks, the river bottom is sand. BOATING: The Ashuelot is a perfect flat-water river for all abilities. We rent canoes and kayaks and offer shuttle service upstream for two different trips. You are welcome to bring your own boats and we can also point you to secluded paddling on nearby lakes and ponds. BIKING: We have bikes to rent. Ride through the Dickinson Memorial Forest just upriver from the campground, and onto the Ashuelot Rail Trail. Information is available in the office – the rail trail is well developed from Pine Street north, and less developed to the south, all the way to the Connecticut River. There is also great road biking, including a scenic covered bridge loop that takes you over several of the area’s covered bridges. SHUTTLE SERVICE: We offer shuttle service to two different put-ins on the river for paddling – your boats, or ours. BIRDING/NATURE OBSERVATION: The river’s edge is a rich ecosystem for native birds, mammals and plants; the Dickinson Memorial Forest provides access to undeveloped riparian woods, a great place for a picnic. We have field guides and binoculars to borrow in the office. PLAYING TOGETHER: Throw a Frisbee or horseshoes; fly a kite or play ball in our field; let the kids enjoy our playground and the Game Room … with a pool table, ping-pong tables, air hockey and foosball. 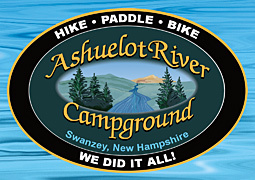 Ashuelot River Campground offers canoe, kayak and bike rentals! Enjoy a day on the river or biking the nearby rail trail and country roads. Explore historic covered bridges by land or by river. You must be 18 years of age or older to complete the rental agreement. Canoes include life preservers and paddles for 2 people. Kayaks include a life preserver and paddle for 1 person. There are six covered bridges within easy reach of the campground. Check out the SouthwestNH website for a complete description. From the campground you can access a scenic 12.5 mile loop over four covered bridges. More ambitious bikers can ride about 26 miles and cross all six bridges! MONADNOCK: The gem of Southern New Hampshire, Mount Monadnock is a 3166 ft. high mountain with a bald summit, accessible for hikers of all abilities. The State Park is just under 40 minutes from the campground and the mountain summit can be attained in a day trip for the whole family. 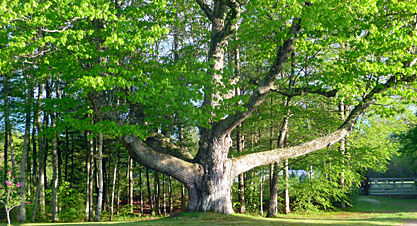 PISGAH STATE PARK: Pisgah State Park is just 25 minutes to the west and offers 21 square miles of open space and forest land – NH’s largest park. Six trailheads open the doors to the backcountry via hiking, mountain biking ATV riding and horseback riding. The hills and valleys of Pisgah are riddled with fishing opportunities. Pisgah State Park offers some of the best mountain biking in the state with trails up to 20 miles in length, dirt roads and single track. More information about activities in Pisgah can be found by visiting Friends of Pisgah. PACK MONADNOCK: Miller State Park is New Hampshire’s oldest and centers on the 2290 ft. high mountain Pack Monadnock. Several footpaths lead to the summit – each only 1.5 miles long – or take the auto road to the top. SWANZEY TRAILS: Swanzey has a very active Open Space Committee that has worked to set aside important natural areas within a few minutes of the campground. Hike Honey Hill, Tippin Rock and other places on short nature trails less than a mile in length. We have maps in the office. MOUNT WANTASTIQUET: Wantastiquet Mountain Natural Area is just 30 minutes from the campground. You can even hike with the kids to the ruins of an old mansion in the Madame Sherri Forest. CHESTERFIELD GORGE NATURAL AREA: Spanning 13 acres, it offers great opportunities for hiking, as you explore the footpaths along the gorge and enjoy the scenic views. About 20 minutes from the campground. RHODODENDRON STATE PARK: About 30 minutes from the campground, this park is named after the 16-acre grove of Rhododendron Maximum, which is its focal point. A 0.6 mile-long universally accessible trail encircles the grove allowing visitors to observe, close up, the fragrant clusters of pink blossoms as they burst into bloom in mid-July. From early spring to the first frost, wildflowers bloom throughout the 2,723-acre park. The last blooms in the fall are complemented by the forest’s brilliant foliage. The rhododendron grove, which is the largest in northern New England, was designated a National Natural Landmark in 1982. More ambitious hikers can hike to the summit of Little Monadnock Mountain, about 3 miles round trip. SHIELING STATE FOREST: A multifaceted, enjoyable walk through an intriguing range of sites with monolithic glacial boulders. Well-designed and easily walked, this varied trail winds through a forest with a broad range of fascinating sites for its relatively small acreage – 45 acres. About 25 minutes from the campground. CROTCHED MOUNTAIN: With over 1,200 acres of permanently protected forest, open fields of wild blueberry and heather, and mysterious wetlands, Crotched Mountain is a place of unusual beauty. Memories of hiking these woods to reach the summit, gazing at the sunset, or listening to the chatter of birds in an active wetland can last a lifetime. Crotched Mountain’s accessible trails provide a place where everyone – people with disabilities, seniors and families with children – are welcomed and able to experience nature up close. About 25 minutes from the campground. CATHEDRAL OF THE PINES: Situated on a hilltop with a panoramic view of the Grand Monadnock, the Cathedral of the Pines is a breathtaking open-air cathedral and meeting space on 236 acres. Historic monuments honor the service of American men and women — both military and civilian. Visitors from all over the world are welcomed to participate in events and to explore the extraordinary sanctuary grounds, meditate in outdoor chapels and gardens, and learn the history. The public is welcome to stroll the grounds from May 1 – October 31, free of charge. About 25 minutes from the campground. Pisgah State Park offers some of the best mountain biking in the state with trails up to 20 miles in length, dirt roads and single track. Drummer Hill offers intermediate and expert single track riding in Keene. Trails.com has more information about trails in the Monadnock Region. Along with the river, there are a handful of sweet swimming spots within a half hour of the campground. Otter Brook State Park is a favorite among families; Surrey Mountain Lake and Spofford Lake have nice beaches. There's a rocky river swimming hole in Gilsum at the stone arch bridge there. Killburn Pond in Pisgah State Park is a more remote, spectacular spot 3/4 of a mile off the road. Spofford Lake, Swanzey Lake, Pisgah Reservoir, Meetinghouse Pond and more… the Monadnock Region is rich in hot fishing spots. Ask us and we’ll point you in the right direction. MONADNOCK SPEEDWAY and WINCHESTER SPEEDPARK: We are about 15 minutes from both tracks. MONADNOCK MUSIC FESTIVAL: July - August. Monadnock Music is a meeting place where listeners, performers, and composers come together each summer to nurture a vision of what our collective musical life can be. The ideal of making the best in music available to everyone is the driving force behind Monadnock Music. Of the thirty-plus concerts, half of them are free of charge and occur in the central meetinghouses and churches of the many small towns that dot the region. In the central town of Peterborough, a weekend ticketed series presents music of many genres, from recitals to choral and orchestral concerts, even the occasional opera. RIVERFEST: Jaffrey - Last Saturday of July. A downtown event with crafts, music, hot air balloon rides and much more. MONADNOCK PUMPKIN FESTIVAL: Cheshire Fairgrounds - Mid-October. The Monadnock Pumpkin Festival is a family friendly event that will include a huge display of jack-o-lanterns, a pumpkin catapult, a haunted maze, a carving contest, a pumpkin baking contest, amusement rides, fireworks by Atlas Fireworks, and much more. PICKLE FESTIVAL: Winchester - September. An old-fashioned town fair. Downtown Winchester becomes the fairgrounds, with Main Street (Route 10) the parade route. Kids march along with the parade, which features local pickle-themed floats, plenty of pickle costumes and marching bands. Along the route are craftsmen, food booths, and a lively competition among local cooks for the best jar of pickles. There are free pickles for everyone. Live music goes on all day. FITZWILLIAM STRAWBERRY FESTIVAL: On the Historic Town Common - Last Saturday in June. Fitzwilliam Historical Society’s Annual Fundraiser on the historic town common rain or shine. Luscious strawberries, fresh whipped cream, warm biscuts, homemade lemonade and music. Free guided tours of the Amos J. Blake House Museum. (603) 585-7742. HILLSBOROUGH BALLOON FEST & FAIR: Grimes Field, Hillsborough, NH - July. Balloon flights over New Hampshire’s beautiful Monadnock Region are available to the general public along with tethered flights for the more cautious. Saturday night’s fireworks extravaganza is one of the premier fireworks displays in all of New Hampshire. A true hot air balloon festival featuring balloon lift offs at 6:00 AM & 6:00 PM (weather permitting), carnival midway, parade, road race, fireworks (Saturday night, weather permitting), food, live entertainment and fun for the entire family. FREE. (603) 464-0377. CHESHIRE FAIR: Swanzey - End of July - Early August. From animals to zucchini, fairgoers find something for every family member – Horse Pulling for Dad – Country Music for Mom – Carnival Rides for the Kids – and a Demolition Derby for the whole family. FESTIVAL OF FIREWORKS: Jaffrey - at the Jaffrey Airfield Silver Ranch. KEENE MUSIC FESTIVAL: Keene - Last Saturday in August or First Saturday in September. The Keene Music Festival began in the summer of 2001. Its mission is to lend support and inspiration to local musicians through the creation and production of an annual, outdoor performance event. There are three local wineries within 30 minutes of the campground. Local and imported grapes, tastings and tours. SUMMIT WINERY: The Summit Winery is about 20 minutes away and offers free tastings on weekends. POOCHAM HILL WINERY: Poocham Hill Winery is also about 20 minutes away. WALPOLE MOUNTAIN VIEW WINERY: Walpole Mountain View Winery is perched atop a mountain with beautiful views from its tasting room, about 30 minutes from the campground. The Monadnock Region is rich with cultural and historical sites from museums and concerts, to antique shops and historical houses, galleries and fairs. Enjoy the area’s covered bridges by bike, car or canoe. Keene has many fun restaurants, a good movie theater and music venues, not to mention fun shopping in the historic downtown. APPLE HILL CENTER: Apple Hill Center exists to create, perform, and teach chamber music at the highest standard, broaden he appreciation of chamber music through the development of educational programs, and cultivate connection and understanding among people of diverse backgrounds and cultures through the Playing for Peace™ program. Summer concert series. SHARON ARTS CENTER: Peterborough. A non-profit organization supporting artists and craftspeople. Exhibits and events centering on the arts. WYMAN TAVERN: Keene. Keene Minutemen gathered there to march to Lexington at the outbreak of the American Revolution. Exhibits and tours.